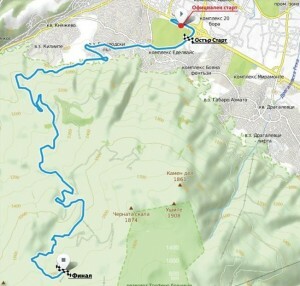 The second edition of the road race Vitosha Uphill will be held on 6th June. The event is organized by Sports Club DRAG, with the participation of Doltcini and Sopharma. The format of the competition provides completely uphill route that starts at Boyana Residence and finishes at Zvezditsa hut. The distance of the race track is 20 km and the total displacement is 1069 m.
The competition aims to encourage more people to try and enjoy road cycling. It is aimed not only at professional road cyclists but also at anyone who would like to rise to the challenge of cycling up Vitosha mountain to the highest point accessible by road. The prize fund is 3000 lev includes vouchers for chain stores DragZone and cycling clothing Doltcini. More information about enrollment and conditions for participation – in the Ordinance for the competition. The race will be held on Saturday 06.06.2015. Rapid /Speedy start – We ride along Daskal Stoyan Popandreev Str, Ivanitsa Danchev Str, Belovodski Pat Str. Finish Zvezditsa Hut, Vitosha Mountain 1718 metres altitude. Award ceremony Zvezditsa Hut will take place up to 1 hour after the medallists have finished. Please note the competition finishes at Zvezditsa Hut, the organizer bears no responsibility for the descent back to Sofia. Technical cars are forbidden to leave Zvezditsa Hut until the arrival of the last rider. If any one category has less than 5 people the organizers reserve the right to include them in another group’s ranking. To sign the declaration attesting their good health and cycling skills (Download declaration here: https://dragbicycles.com/?menu=download-documents ). The organizers and commissaires reserve the right to stop any competitor it considers unfit to complete the race. All participants under 16 years old (except licensed riders) must provide a written declaration from a parent (signed by the parent at registration or in front of the team leader). on the day of the competition (from 08:30 to 10:00) – 50 lv. Licensed road racers must send their application by email to marketing@velomania-bg.com until 06.06.2015. They are exempt from paying the entry fee. 5 All participants are obliged to wear a helmet. 6 Assistance from motorised vehicles is not allowed. Note: You must have life insurance. We recommend that every participant should have a cell phone with a fully charged battery in case of accidents. Трите имена на участника, Рождена дата, Състезателна група, за Изкачването на Витоша 2015 г., Град, Адрес и задължително Телефон за контакти. Организаторите ще се свържат на посочения телефон за обратна връзка, за да потвърдят регистрацията на участника. You must also fill in and submit the ‘Declaration of Participation’ at the same time. Your race number will be handed to you when registering or at the start. The organizers and co-organizers are not authorized to make individual life insurance for the competitors. Insurances should be made in the authorized insurance offices. The documents must be presented at the start. Competitors with no insurance should be disqualified. Declaration of Participation must be filled out by every participant when registering and paying the fee. The declaration states you are participating at your own risk, are aware of the risks of cycling on the road, and are aware of the terms and conditions of this event. Proof of paid entry fee. Note: licensed riders of UCI need only to show their license. Vouchers for DragZone shop – 1500 lv. Vouchers for Doltcini online store (https://e-doltcini.com/bg/) – 1500 lv. Winners are awarded in each age group and category. All those ranked from 1st to 3rd place in the individual disciplines of the competition program by age group will be awarded with medals and vouchers.